The general image of vaccines is of an absolute good without downside. The reality, though, is far different. Even officials promoting them admit that the individual takes a risk with every jab “for the greater good”. But is it? And who has the right to decide whether your child is vaccinated … for the greater good, but not his own if he’s one of those whose life is devastated. “THE GREATER GOOD looks behind the fear, hype and politics that have polarized the vaccine debate in America today. This film recently received the 2nd annual “Koroni Award for a documentary feature addressing an issue of importance to public health” at the Sidewalk Film Festival. It also received the Cinematic Vision Award at the 2011 Amsterdam Film Festival. From my point of view, this film couldn’t be more timely and if you have any interest in the vaccine controversy is a must see. I sincerely hope you will share this article with family, close friends and social networks while free viewing of the film is still available, and urge everyone you know to take the time to watch it. But this film is focused on analyzing what can be done to create positive change and reduce irrational fears so parents and doctors can work together to minimize vaccine risks vaccine risks to individuals and our population. The film seeks to open the channels of communication between parents, doctors, and policy makers to listen and learn from each other in order to begin a rational discussion about vaccine safety. After all, don’t all of us want our kids to be healthy and safe from unnecessary harm? In order to ensure the safety of as many children as possible, we cannot continue to ignore the signs that maybe we’ve taken vaccines as our primary disease prevention strategy too far; to the point that we’re now seeing too many people being hurt. Unlike many other TV programs and documentaries on this topic, The Greater Good takes care to acknowledge both doctors and scientists, who advocate for mass, mandatory vaccination policies as well as those, who question the science, policy and ethics of current vaccine policies. From my point of view, there can be little doubt that we need to review the safety and effectiveness of the current vaccination program in the U.S., and this review needs to include methodologiclly sound investigative science. If we don’t do that now, we may not be able to stop further damage to the health of future generations of children. Public health officials have long insisted that vaccines are the best way to protect the public health. As a result, the number of doses of vaccines included in the childhood vaccination schedule has tripled over the past 30 years, from 23 doses of seven different vaccines in 1980 to 69 doses of 16 different vaccines in 2010. However, alongside the rise in administered vaccines, we’ve also seen a significant rise in children with chronic disease and disabilities. For whatever reason, our kids are getting sicker. Infant mortality has also risen. In 1960, America ranked 12th in infant mortality among all nations of the world. By 2005, we ranked 30th. Furthermore, more full term babies die before their first birthday in the US than in most European countries, and the US gives its infants more vaccines than any other country in the world. So, could it all be a coincidence? The truth is, we don’t know. No one has formally and independently studied the health outcomes of vaccinated versus unvaccinated children, and this is something that needs to be done not just for each individual vaccine, but also for multiple vaccine combinations. The research is INCOMPLETE, and that is a major part of the problem. How can you claim a pharmaceutical product like a vaccine is safe for everyone and that using multiple vaccines from day of birth throughout childhood is a wise public health policy when that policy has not been adequately studied? As a nation, the U.S. is gambling the health of its citizens on assumptions. Vaccines are currently approved based on the research submitted to the government by the drug companies that have developed the new vaccine and funded the pre-licensure studies. Many of the studies drug companies conduct do not use true placebos and have only a few hundred or a few thousand healthy people enrolled, who do not match the health profile of the millions of people told to get the vaccine after it is licensed. The safety of vaccine policies are primarily based on the word of the companies that produce and profit from vaccines and enjoy a liability shield from vaccine injury lawsuits in civil court that was given to them by Congress and the Supreme Court. Furthermore, the mass vaccination program takes a one-size-fits-all strategy approach. It does not acknowledge that we are all individuals with different predispositions and health status, which can play a significant role in how we react to vaccines or prescription drugs. For example, research by Dr. Natasha Campbell-McBride indicates that children with compromised gut flora are particularly prone to vaccine damage. Currently there is almost no individual screening done by most doctors to assess whether an individual is at high risk for having a vaccine reaction that can end in serious health problems or even death. Wouldn’t it make sense to do everything possible to minimize vaccine risks? After all, while increasing numbers of parents opt to delay vaccinations or opt out of vaccines for their children, there are many parents who want to vaccinate their children and they deserve to have confidence that everything possible is being done to minimize vaccine risks for their child. In 2006, Merck released Gardasil, a vaccine designed to protect young girls and women against being infected with four strains of human papillomavirus (HPV). The idea was that if HPV infection , which is cleared asymptomatically within two years by more than 90 percent of those who get it, is that HPV associated cervical cancers in women would be prevented. One of the three vaccine injury cases featured in The Greater Good movie is that of Gabi Swank, a 15-year-old honor student who decided to get the Gardasil vaccine after seeing a “Be One Less” Gardasil vaccine advertisement on TV. Like so many young girls, she wasn’t warned about any possible side effects when she got the shots, which are given as a series of three injections. Gabi is now a Gardasil injury statistic, a young girl permanently disabled by the vaccine. Judicial Watch, the public interest group that investigates and prosecutes government corruption, recently issued an update on adverse reaction reports relating to Gardasil. The documents obtained from the U.S. Food and Drug Administration (FDA) under the provisions of the Freedom of Information Act (FOIA) detail 26 new deaths reported following HPV vaccination between September 1, 2010 and September 15, 2011. That’s 26 deaths of young, previously healthy girls in just one year. Between May 2009 and September 2010, 16 deaths occurred after Gardasil vaccination. For that timeframe there were also 789 reports of “serious” adverse reactions, of which 213 resulted in permanent disability and 25 resulting in a diagnosis of Guillain Barre Syndrome, Judicial Watch reported. Unfortunately, many elected officials are doing just the opposite. Texas Governor Rick Perry is a perfect example. In 2007, he signed an Executive Order mandating all 11- and 12-year-old girls in Texas to get the HPV vaccine. Fortunately, the law was overturned two months later, after a firestorm of opposition. Many have now connected the dots and exposed his too-cozy ties to Merck, the maker of Gardasil More recently, Calfornia Governor Jerry Brown signed a bill allowing minors to be given Gardasil vaccine (and other vaccines for sexually transmitted diseases) without their parents’ knowledge or informed consent.. Annual PAP Test Now Discouraged. Why? It does not even hint at the many thousands of serious adverse events reported after Gardasil vaccinations to the government’s Vaccine Adverse Events Reporting System (VAERS) since its approval, including 26 deaths in the past 12 months alone! Furthermore, the death rate from cervical cancer in the United States is a mere 3 per 100,000. Your daughter has a much higher risk of dying in a car accident than she does dying from cervical cancer. Cervical cancer rates are even lower in some European countries. The reason why the mortality rate is so low is because the immune system’s of the vast majority of women is usually strong enough to clear up this kind of infection on its own, and does so in more than 90 percent of all cases. The CDC even admits to this fact on their website. For the “Greater Good” – At What Price? Rigidly maintaining the assumption that one-size-fits-all mass-vaccinations are necessary and “for the greater good” fails to take into account the possibility that there is harm being done to an increasing number of people, who are not being counted when vaccine benefit and risk calculations are done by health officials. Keep in mind that to this day, we have NO reliable data indicating just how many children are truly being harmed by any particular vaccine, as adverse event reporting is completely voluntary. Many people are still unaware that the CDC’s Vaccine Adverse Events Reporting System (VAERS) even exists, or that you can file a report yourself if your doctor fails to make a report.. The CDC itself admits that only a small fraction of hospitalization, injuries and deaths after vaccination are ever reported. In one 1993 article in the Journal of the American Medical Association, former FDA Commissioner David Kessler estimated that fewer than one percent of all doctors report injuries and deaths following the administration of prescription drugs. This estimate may be even lower for vaccines. According to Barbara Loe Fisher, one survey conducted by the NVIC in New York in 1994 revealed that only one doctor in 40 reported to VAERS. In an ideal world scenario, any and all adverse events would be reported following vaccination, and health outcomes would be evaluated long-term. Today, many doctors and health authorities simply dismiss adverse events as “unrelated” to the vaccine. But on what do they base their conclusions? I urge you to take the time to watch The Greater Good, and start to think about some of the profound questions raised in the film. What we need is an open, intelligent, civil dialogue about how we can ensure the health and well-being of our children, and that doesn’t mean it has to be all or nothing! Everyone should be allowed to exercise voluntary, informed consent to vaccination and that means you should be able to use every recommended vaccine, some vaccines or no vaccines at all. We should all have the legal right to make informed, voluntary decision about any drug or vaccine or medical procedure that carries risk to our health or the health of our children. When our government recommends doctors give children 69 doses of vaccines and many of those vaccines are mandated, safety MUST become the FIRST priority for public health officials, and doctors giving vaccines. It is essential that the appropriate studies be done to find out if the current vaccine schedule is doing far more harm than good. There’s ample evidence showing that the US government, through the CDC, has an enormous, well-coordinated plan to mass-vaccinate with as many vaccines as possible.1 This plan has been ongoing for years, and has grown exponentially. They’ve covered all their bases by enjoining numerous legislative groups, such as Women In Government2 (whose sponsors3 include Merck, Eli Lilly, and GlaxoSmithKline), and physicians’ groups like the American Academy of Pediatrics. These are just two examples – there are literally dozens, and possibly more, groups and individuals that are collectively pushing vaccines. Pushing matters even further, in Indiana, a new law now requires churches with day care centers to make sure each child has received “age appropriate” vaccines as determined by the state department of health4 – effectively removing a parent’s right to change their child’s vaccine schedule. The old law only required parents to inform the church day care center that they objected to vaccines for religious reasons. It did not make churches the enforcers of the state vaccine schedule. Another strategy to increase vaccination rates and coverage is to push combination vaccines.6 This saves money and increases vaccination rates at the same time. Never mind the fact that most drug company pre-licensure studies do not study new combination vaccines given simultaneously with all the other vaccines licensed and recommended to demonstrate that giving children multiple doses of vaccines at the same time is actually safe. While it seems “old-fashioned,” the only truly effective actions you can take to protect the right to informed consent to vaccination and expand vaccine exemptions, is to get personally involved with your state legislators and the leaders in your community. 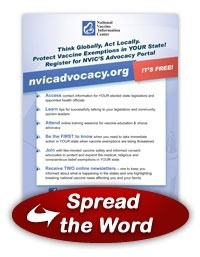 Signing up for NVIC’s free Advocacy Portal at www.NVICAdvocacy.org not only gives you access to practical, useful information to help you become an effective vaccine choice advocate in your own community, but when national vaccine issues come up, you will have the up-to-date information and call to action items you need at your fingertips to make sure your voice is heard. Write or email your elected state representatives and share your concerns. Call them, or better yet, make an appointment to visit them in person in their office. Don’t let them forget you! It is so important for you to reach out and make sure your concerns get on the radar screen of the leaders and opinion makers in your community, especially the politicians you elect and are directly involved in making vaccine laws in your state. These are your elected representatives, so you have a right and a responsibility to let them know what’s really happening in your life and the lives of people you know when it comes to vaccine mandates. Be sure to share the “real life” experiences that you or people you know have had with vaccination. If you or a family member has suffered a serious vaccine reaction, injury or death, please talk about it. If we don’t share information and experiences with each other, everybody feels alone and afraid to speak up. Write a letter to the editor if you have a different perspective on a vaccine story that appears in your local newspaper. Make a call in to a radio talk show that is only presenting one side of the vaccine story. I must be frank with you; you have to be brave because you might be strongly criticized for daring to talk about the “other side” of the vaccine story. Be prepared for it and have the courage to not back down. Only by sharing our perspective and what we know to be true about vaccination will the public conversation about vaccination open up so people are not afraid to talk about it. We cannot allow the drug companies and medical trade associations funded by drug companies to dominate the conversation about vaccination. The vaccine injured cannot be swept under the carpet and treated like nothing more than “statistically acceptable collateral damage” of national one-size-fits-all mass vaccination policies that put way too many people at risk for injury and death. We shouldn’t be treating people like guinea pigs instead of human beings. NVIC’s Quick Fact Information on Diseases & Vaccines: Learn more about the 16 diseases and vaccines licensed and recommended by doctors for children and adults. Find out what the vaccine manufacturers, government and medical trade groups say, along with independent analyses and live links to references, so you can do your own research. If your pediatrician or doctor refuses to provide medical care to you or your child unless you agree to get vaccines you don’t want, I strongly encourage you to have the courage to find another doctor. Harassment, intimidation, and refusal of medical care is becoming the modus operandi of the medical establishment in an effort to stop the change in attitude of many parents about vaccinations after they become truly educated about health and vaccination. At least 15 percent of young doctors recently polled admit that they’re starting to adopt a more individualized approach to vaccinations in direct response to the vaccine safety concerns of parents. It is good news that there is a growing number of smart young doctors, who prefer to work as partners with parents in making personalized vaccine decisions for children, including delaying vaccinations or giving children fewer vaccines on the same day or continuing to provide medical care for those families, who decline use of one or more vaccines. Listed below are links to blogs that reference this entry: Vaccine Law Threatens Parental Rights for ‘the Greater Good’. This page contains a single entry by Toni published on March 20, 2013 2:02 PM. Are Peanut Adjuvants in Vaccines Responsible for the Peanut Allergy Epidemic? was the previous entry in this blog. Monsanto’s Death Grip on Your Food is the next entry in this blog.